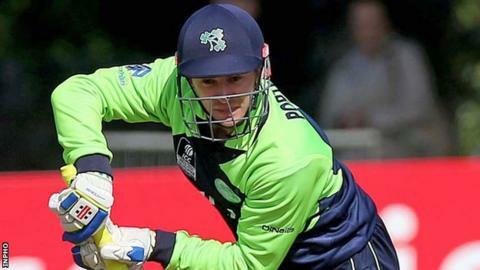 Ireland have lost their second successive match at the ICC World Twenty20 qualifier as Hong Kong claimed a five-run win at Malahide. Hong Kong, put in to bat, were restricted to what looked a modest total of 129-8 at a windy Dublin venue. The Irish faced some accurate bowling but will be disappointed to have fallen six runs short and their hopes of finishing top of Group A are unlikely. They have one match left which is against Jersey on Sunday. If they did not top their group, William Porterfield's team would still be fancied to seal a place in the 2016 World Twenty20 in India by winning at the quarter-final stage of the qualifier. Having seen their run of 21 consecutive victories in the tournament ended by Papua New Guinea on Wednesday, Ireland fell six short of their 130-run target despite taking 17 from the final over as John Mooney launched a late, desperate assault. Ireland looked to be in with a chance when they headed into the final four overs at 93-4 needing 37 more, but the loss of Porterfield for 28 and Stuart Thompson to successive balls, with Stuart Poynter dismissed for seven three balls later, proved fatal as they finished on 124-8. Earlier, Porterfield's decision to invite Hong Kong to bat looked to have been justified when his bowlers restricted the batting side to 129-8. The most notable contributions came from Nizakat Khan, who scored 25 off 21 balls, and top scorer Mark Chapman, who took 30 from the 24 balls he faced as Kevin O'Brien claimed three for 32 with support from Mooney and George Dockrell with two apiece. Ireland captain William Porterfield: "In the last two games our batting has been disappointing. "We left it all too late and should have made it easier for ourselves. "Now, we have to beat Jersey and then see where we are."